If the SmartKey is in position 0 in the ignition lock for an extended period of time, it can no longer be turned in the ignition lock. The steering is then locked. To unlock, remove the SmartKey and reinsert it into the ignition lock. The steering is locked when you remove the SmartKey from the ignition lock. ► Remove the SmartKey when the engine is switched off. The starter battery could otherwise be discharged. If you cannot turn the SmartKey in the ignition lock, the starter battery may not be charged sufficiently. ► Check the starter battery and charge it if necessary . ► Jump-start the vehicle . You can only remove the SmartKey if: Rthe SmartKey is in position 0 in the ignition lock. 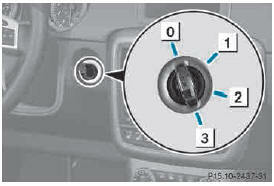 Rthe automatic transmission selector lever is in P.